GPGMail expires after some time and I have to quit mail. I'm running mail 24/7 because it also runs my Spamfilter as well. So please remove this feature again. If you're so keen on charging, get some other idea or start selling license codes. very sorry to hear you're running into problems. We've added the expiration to make sure that the beta is no longer used after the stable release is out and meant for users who do not regularly update to new betas once they come out. The earliest it should expire is December 3rd, so this is obviously a bug. Could you describe what happens after you restart Mail? Is GPGMail properly working again? GPGMail continued working until now. I set in my preferences everything to Autoupdate. You might want to add an option in the final release for enabling the usage of betas. I have installed the current beta and after about 1 hour I also get the expire message. In the preferences I have not checked any auto update options. Same issue here. The plugin tells me that it is expired and asks me to quit the Mail app. the life time of the "valid" license was only some minutes here. I had the same happen this morning. I didn't have auto-updates checked, however when i checked, I was runing the most recent (2.5b1 build 783b). There was a crash dump at the time. Attached. Same her. After starting mail the expired message appears after about 1 hour. Rerstarting the mail app works but after 55 minutes the same thing happens. Same here, GPGMail tells me that the beta is expired and I need to quit Mail. When I start Mail again I can use it for some time again. I suggest that you might offer pre-release licenses so that one can buy them before the actual stable version is released. we're very sorry for this terrible experience. The beta of course shouldn't expire for a very long time. The bug seems to be directly connected to the gpg crash some of you are seeing at the same time. We will release an update very soon! Hi all, same here. Just had to quit mail.app because PGPmail beta expired. I only installed the beta earlier today - not exactly a very long half-life. 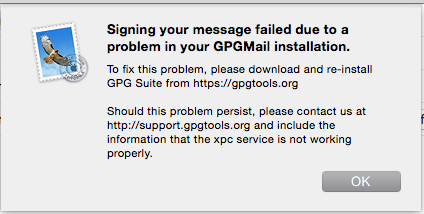 After restarting mail.app everything seems to be fine, except for PGP, which seems to be disabled now. would the same features be available with the nightly builds or do we need to re download the new beta version? Don't know if this matters, but I didn't experience a crash. this is not consistent for all users. The beta runs fine on my test system. But it happens to quite a few users. And we have an idea what could be going on, but no solution to fix the problem yet. We'll update as soon as we have news. I just realised that gpg2 is crashing in the background here, too. I see the crash log in Console.app. The crash log looks similar to the one attached to Comment #7. The intervals between the crashes are different. Yep, too many users are seeing this. We're sorry! We hope to have a fix soon. Just installed this update and it appears to install fine. However when I attempt to send a signed message it fails with the attached message. If I send an encrypted email, it sends fine but then I am unable to decrypt. I'm running the 10.10 and the beta of GPG Suite. Matt, could you try reinstalling the beta Suite from our homepage and after that again running the updated GPGMail installer. Is there a ETA for the paid version? rec0n: We have an internat ETA yes. Let's hope we can make it. But for the time being, it's beta-time. We just fix the two most annoying issues with the beta. Which should make it a lot more usable already (also this bug should not have happened in the first place to be honest). Matt: any news from your side? Sorry Steve...I'm at work. Will hopefully have some time to tinker when I get home later this evening. I will try the original installer followed by the updated installer as my first task. Where can I submit any interesting/useful console logs ? Matt, let's do it like this: I'm closing this discussion, since the other feedback has been positive about the fix. If your trouble persists, please do open a new discussion. You can attach any logs / info there. Please set your new discussion to "private". That means only our core-team and the company hosting this support platform are able to access this discussion. Steve closed this discussion on 11 Nov, 2014 11:46 AM.